A root hook is perfectly suited for untangling pot bound roots, loosening root balls before transplanting, and is also good at loosening knots as long as used carefully! When you have potted plants you inevitably have pot bound plants. 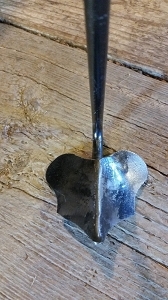 This tool, used in Bonsai, is for prying and teasing loose pot bound roots. Rather than slicing them with a knife, further traumatizing an already stressed plant, gently pull the roots apart with the root hook. Your plant will recover much faster from this type of handling. If you have more than a few plants in pots, this is an essential too.